Almost any well-drained soil Scented Geranium, Pelargonium speciesScented Geraniums are among the most pleasant herbs to grow. They come in an extraordinary variety of intense fragrances and diverse soft leaved patterns. These include the old-fashioned rose geraniums; lemon; lime and other fruity scents; the spicy scents of ginger, nutmeg and peppermint; as well as pungent oakleaf and eucalyptus fragrances. The fragrance of scented geraniums vary from person to person, but seldom do they disappoint. Leaf forms may be lacy, fan shaped or divided like a pheasants foot, a crows foot, an oak leaf, a maple leaf, a ruffle, a grape leaf or a spreading umbrella. Textures may be velvety or sticky. In fact there are over 250 varieties. Of these 50 to 75 are commonly cultivated. Not surprisingly, the primary appeal of scented geraniums is in perfumery. Their essential oils add an uplifting note to soaps, lotions and colognes. On their own, the spreading scented geraniums make wonderfully fragrant hanging container plants. The fruit scented types continue to grow through the winter. Large flowered varieties typically go dormant.Of scented geraniums, the old fashioned sweet rose, Pelargonium graveolens, is the all time favorite. These have woody stems, rounded, lobed, fragrant leaves and rose pink flowers. Leaves of rose geranium yield an essential oil similar to that of the rare and valuable attar of roses. In France, leaves are harvested on a large scale for distillation. One pound of leaves, when distilled, will yield one gram of oil. This is the essential oil used in soap, potpourri and perfume. P. crispum. A lemon-scented geranium. P. graveolons. A gentle giant, great in tea and jellies. It has a whisper of rose. P. graveolens. ‘Camphor Rose’ Leaves are velvety soft and camphorous rose to smell. P. g. ‘Rober’s Lemon Rose’ Sweetest of the rose fragrances. P.X limoneum. The lemon geranium is a must for lemon lovers. P.X nervosum. The lime geranium packs a tropical punch. P. tomentosum. Shrubby with large, velvety grapelike leaves scented with peppermint. Sure to please children. Plant from containers in the Spring or Fall in mild region areas. Propagate by cuttings placed in ordinary garden soil. They will root over winter and be ready in the Spring. They must be protected in the winter. They make wonderful, long lived house plants. Flowers are small and for most varieties are not very significant. The fragrant leaves are used in potpourris, and to favor cakes and puddings. 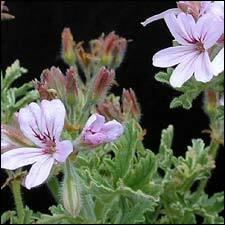 Leaves of rose geranium provide the flavor of rose water to powdered sugar used in baking. Place one or two fresh young leaves in a food processor with sugar and process until finely minced. Use the sugar on fruits, in cookies, frostings, jellies, and teas.